Many people consider autumn the loveliest season at the Baltic Sea. The crowds have started leaving the beaches, the sea shimmers golden, and the forests radiate warm colours – time for long walks on the beach, cycling trips and kite flying. This golden season is ideal for a holiday with the whole family, when activities in the fresh air can be combined with wellness and relaxation. Here are four trip destinations to help you enjoy the autumn in full swing! The enchanting Hanseatic city of Stralsund, with its unique setting close to the Baltic Sea islands of Rügen and Hiddensee, is the ideal holiday destination. City and cultural travellers love the unique flair of the UNESCO World Heritage Site of Stralsund. The historic burgher houses, the lively harbour island with the fascinating Ozeaneum and the historic old town attract guests from all over the world. Here you can enjoy the local cuisine in one of the popular fish restaurants and indulge in the northern German serenity amidst sailboats and smoked fish. The 4-star superior Wyndham Hotel Stralsund HanseDom is ideal for families and wellness guests wanting to spend some relaxing days by the Baltic Sea. Don your bathrobe and head from your hotel room straight to the tropical bathing landscape with several water slides and the oriental saunas at the HanseDom adventure park. The Ahlbeck Kaiserbad offers a variety of interesting attractions. Perhaps one of the most renowned of these is the 280 m-long sea bridge, which dates from Germany’s Industrial Revolution and is one of the oldest in continental Europe. The TRYP by Wyndham Ahlbeck Strandhotel is in a quiet location on the car-free promenade of the popular Baltic Sea Kaiserbad, with direct access to the sandy Baltic beach. The magnificent art nouveau villa offers guests 93 double bedrooms and 11 suites, in which you can enjoy gorgeous views over the Baltic Sea. A swimming pool with panorama window, a sauna and a range of massage treatments round off the recreation facilities for you and the whole family! 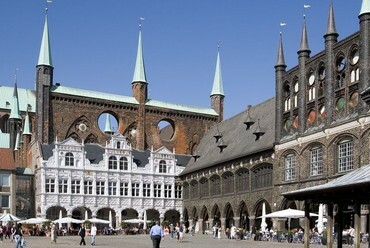 The Hanseatic city of Lübeck is renowned for more than just its famous marzipan. With its medieval town centre, St Mary’s Church and the Holstentor Gate, Lübeck has gained UNESCO World Cultural Heritage status. Whether you’re taking trips around the harbour, city tours or romantic walks: stroll through the lively port city with its maritime flair and enjoy a few fabulous days in beautiful Lübeck! Sit back and reflect on your day over a delightful evening meal in our Meeresbrise hotel restaurant. A trip to Travemünde is highly recommended. It’s the perfect destination for relaxing on stunning beaches and discovering little fishing villages. Book your stay in TRYP by Wyndham Luebeck Aquamarin and enjoy your holiday by the Baltic Sea! The Wyndham Garden Wismar Hotel is situated by the gates of the Hanseatic city of Wismar, the perfect destination for a romantic weekend trip, a culture break or a relaxing family holiday to the Baltic Sea. The lively port city and UNESCO World Heritage Site of Wismar captivates visitors with a city-owned Baltic Sea beach and impressive attractions such as the wonderful marketplace, the famous Church of St Nicholas and the lively waterfront. The cultural programme ranges from performances for children at the puppet theatre, through to classic ballet, symphony concerts, cabaret and plays. After a sightseeing trip or seaside walk, you can relax in the hotel wellness zone with swimming pool, sauna, steam bath, whirlpools and roof terrace with log cabin sauna. Quaint fishing boats, fish restaurants and the famous Brauhaus in the centre of Wismar round off your stay in the Hanseatic city.